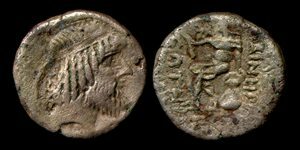 The Kingdom of Characene, located at the head of the Persian Gulf near the mouth of the Tigris, served as a trading center between the Roman Empire and the East for over three centuries. It fell under Sasanian rule in 228 AD. 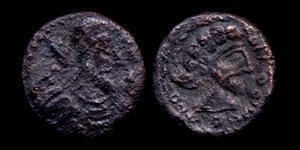 Obverse: Bearded, diademed head right. Reverse: Naked Hercules seated left, resting club on knee. Monogram in upper left field. Greek legend. Note: Courtesy Sam al-Ali collection. Reverse: Naked Hercules seated left, resting club on knee. Monogram in upper left field (?). Greek legend. 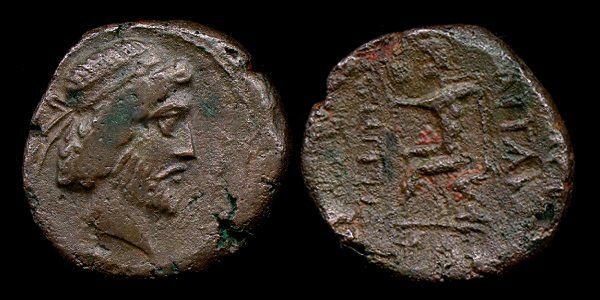 Reverse: Naked Hercules seated left, resting club on knee. Monogram in upper left field, no letter under arm. Greek legend. Obverse: Young, beardless (? 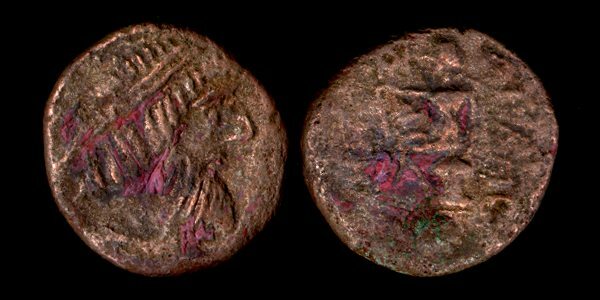 ), diademed head right; unlisted countermark (Dobbins CTA Monogram -) on neck and in right field (Dobbins CTA Monogram -). Reverse: Naked Hercules seated left, resting club on knee. Monogram (?) in upper left field and unclear (Dobbins CTA Letter 3/'Y' (?)) under arm. Greek legend. Seleucid date in exergue (off flan). 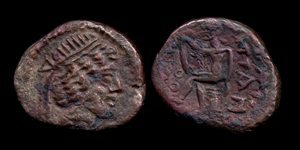 Obverse: Young, beardless, diademed head right; no countermarks. 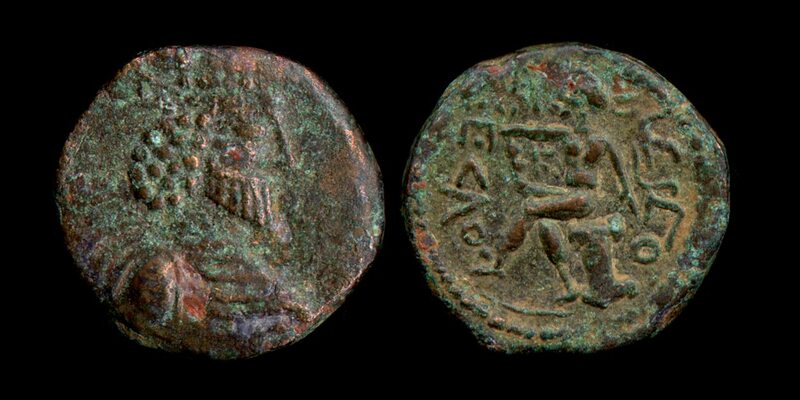 Reverse: Naked Hercules seated left, resting club on knee. Monogram in upper left field and unclear (Dobbins CTA Letter 1/'X' (?)) under arm. Greek legend. 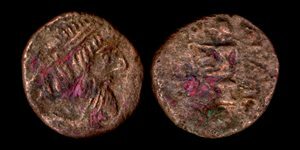 Seleucid date in exergue (unclear). Note: This coin appears to have been silvered. Obverse: Young, bearded, diademed head right; crescent (Dobbins CTA Monogram 15) behind head and unlisted countermark (Dobbins CTA Monogram -) on neck. 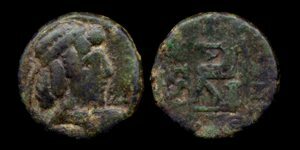 Reverse: Naked Hercules seated left, resting club on knee. Monogram (Dobbins CTA Monogram 6) in upper left field and unclear (Dobbins CTA Letter 12/'M' (?)) under arm. Greek legend. 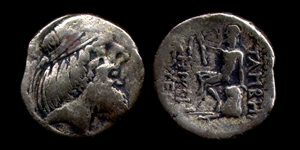 Seleucid date in exergue (off flan). 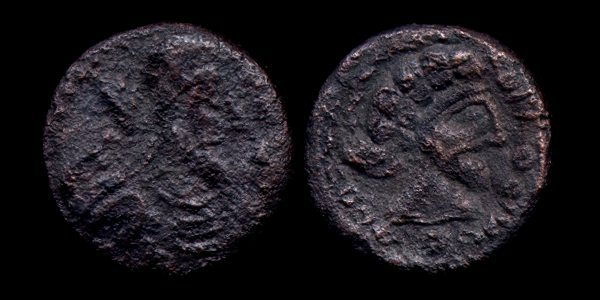 Obverse: Young, bearded, diademed head right; palm branch (Dobbins CTA Monogram 16) in right field; no countermark on neck. Reverse: Naked Hercules seated left, resting club on knee. Monogram (?) in upper left field and unclear letter under arm. Greek legend. 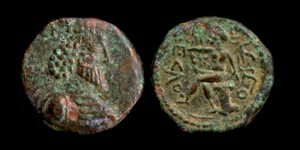 Seleucid date in exergue (off flan). 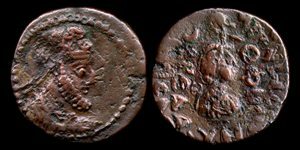 Obverse: Young, short-bearded (? ), diademed head right. 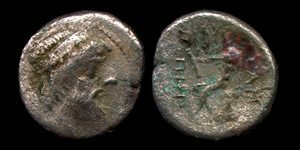 Reverse: Naked Hercules seated left, resting club on knee. Monogram under arm ('A' (?)). Greek legend. 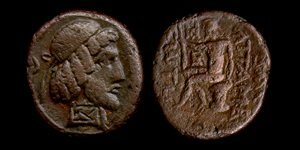 Seleucid date in exergue (off flan). 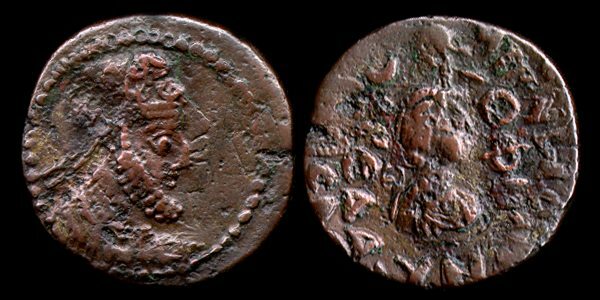 Obverse: Bearded, cuirassed bust right, with tiara adorned with hooks, stars and cresents. 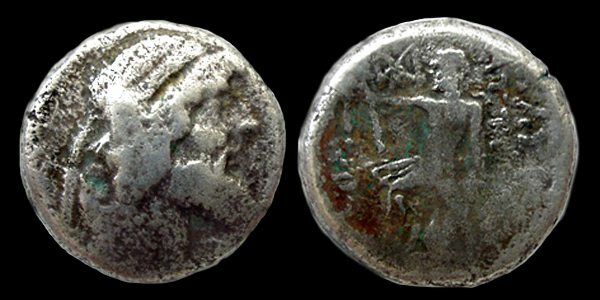 Reverse: Bust of city goddess, right; Greek legend; Seleucid date YN[delta] = 45 = 142 AD in exergue. 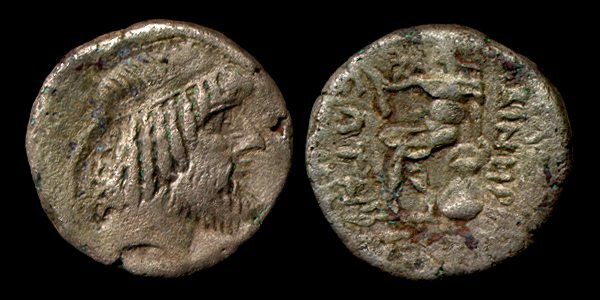 Obverse: Diademed bust with hair bunched at sides and straight, medium beard, right (in Parthian style). 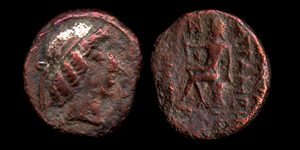 Reverse: Stylized, naked Hercules seated left, resting club on knee. Monogram in upper left field; Aramaic legend. Obverse: Bearded bust right wearing diademed tiara; Aramaic legend. 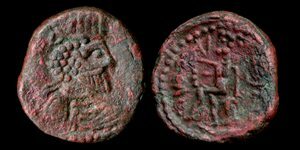 Reverse: Male head right, not diademed, with pointed beard; hair in six rolls. Aramaic legend.